Since 1986, a team of dedicated volunteers has been producing beautiful tapestries and needlework to enhance Culross Palace, drawing on 16th- and 17th-century patterns for their inspiration. Visitors to Culross Palace are often fascinated by the vividly embroidered seat cushions that adorn most of the chairs. The palace is also full of intricate crewelwork curtains and bed hangings, delicate pieces of embroidery and carefully stitched items of clothing. All of these textiles are the product of many hours of hard work by the Culross Needlework Group, stretching back over the last 30 years. The group was formed in 1986 by Sheila McKay, initially to undertake some casual conservation work for the National Trust for Scotland. 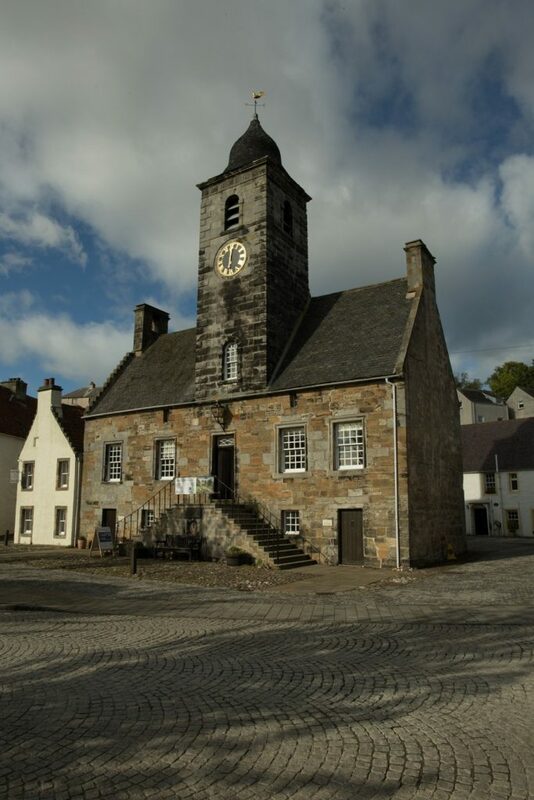 However, over the years the role of the group has changed, and now the ten members produce needlework of all colours, shapes and sizes for Culross Palace. The results add splashes of colour and softness to the dark, wooden interiors. The work of the Needlework Group does more than just brighten up the place. By using contemporary techniques and taking inspiration from contemporary patterns and wall paintings, their textiles help to recreate a sense of the original 16th- and 17th-century spaces. Read on to see more of what we found. This cushion was inspired by a 17th-century original found in the Embroiderers’ Guild Collection. This collection is a vast and varied record of embroidery from the 16th century onwards, highlighting how pieces were made and used in the past. 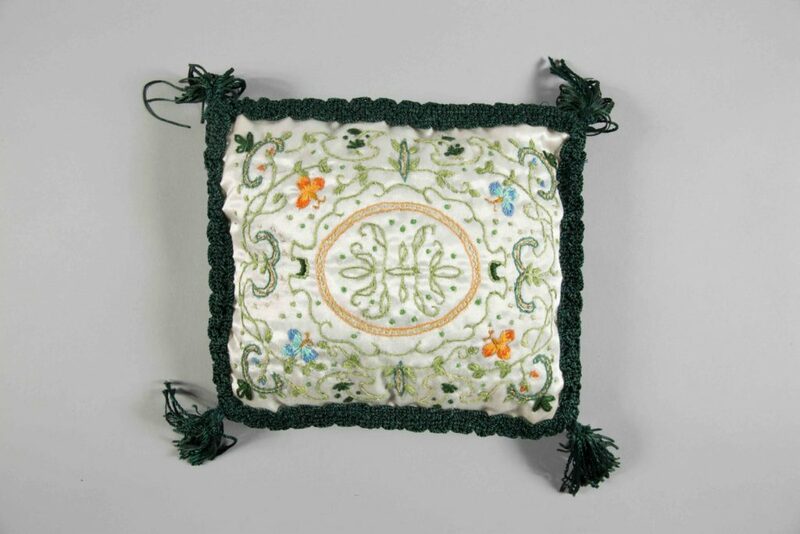 The cushion is stitched in a formal floral design using orange, blue, green and gold threads, with a central oval vine motif atop a white satin base fabric. 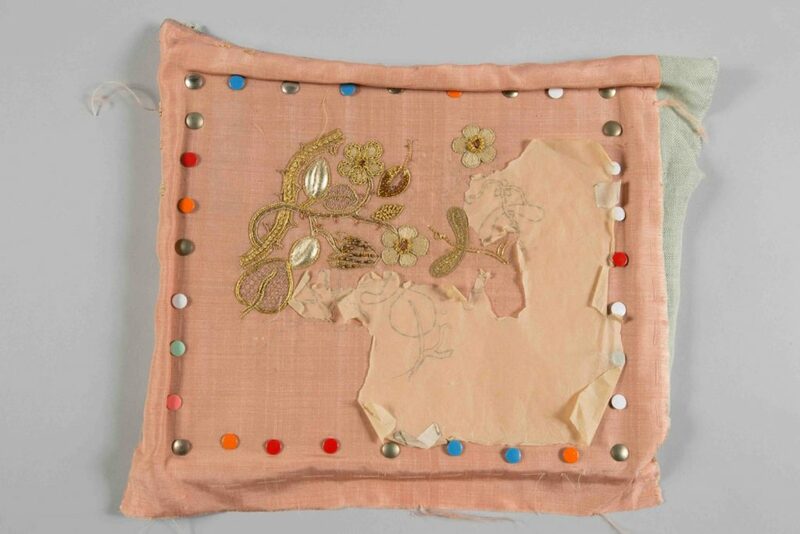 It is a beautiful example of the kind of fine embroidery that would have been worked by the women of Culross Palace. Culross Palace is home to some even more intricate pieces by the Needlework Group, known as goldwork. This usually consisted of silver or gold metal threads and spangles embroidered loosely onto a canvas and fabric background to create a raised 3-D effect. Goldwork was favoured by the wealthy, not only as a means of displaying their wealth, but also as an expression of skill. Many of the materials were imported from Europe, further indicating prosperity and prestige. Although goldwork was around long before the 16th and 17th centuries, by the 17th century it had become a fashionable way to embellish personal costume, and for the decoration of trinkets such as bags and books. Designs would have been sketched or traced onto a base fabric, and the embroiderer would have stitched over the top. Crewelwork was another technique that became very popular during the 17th century. Often worked on a large scale, it was used mainly for furnishings and was created with naturally strong linen twill and 2-ply worsted crewel wool. 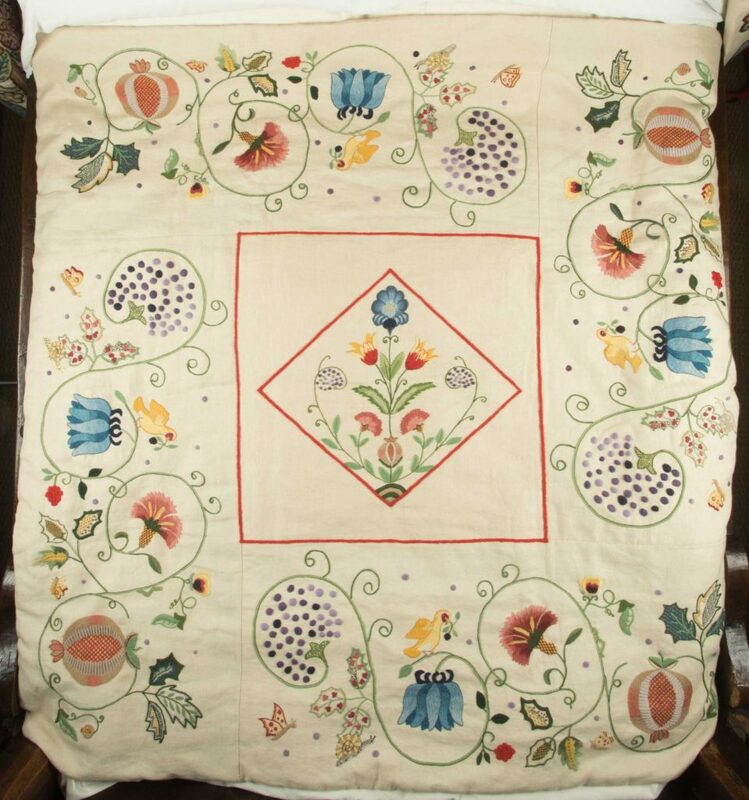 Soft earth tones such as green and blue were predominant and worked into flower, tree and bird motifs in a variety of stitches. 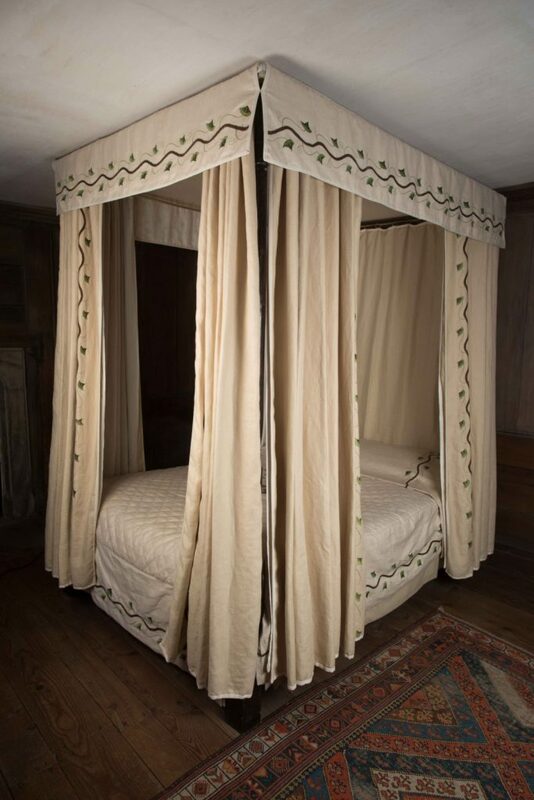 The Needlework Group have created these bed hangings using 17th-century designs; they are colourful, but also heavy, reflecting the practical need for warmth as well as the desire to show off. It is pieces like this that helped the Culross Needlework Group win the NTS Volunteer Group of the Year Award in 2015, and they are by no means done yet. At the moment, they are working on a jacket inspired by an early 17th-century example in the Burrell Collection in Glasgow. Once the painstaking work is finished, it promises to be a stunning addition to the beautiful needlework collection at Culross Palace. This article is byRachael Bowen, Christophe Brogliolo, and Ben Reiss of Project Reveal Team East. Project Reveal is a multi-site digitization project of unprecedented scale. With your support, we can help the Trust manage its collections more effectively. Most important, we can help the Trust discover, better understand, and share its treasures with the world. This article was originally published by the National Trust for Scotland on November 22, 2017.